Sometimes, you might wonder why some people seem to maintain a healthy weight even though you struggle to shed your extra pounds and attain your goal weight. While caloric consumption and how much you expend through exercise and other activities play an important role, the basics of a healthy tummy are often forgotten in the quest to lose weight. There are many nutrients that promote and maintain good health but it's important to consider the very basic macronutrients when you think about a healthy tummy for a healthy weight. Protein is important for many functions in your body but from the perspective of weight loss, eating protein with each meal encourages satiety as it triggers the production of hormones in this area. High protein fad diets have led some people to associate carbohydrates with weight gain. However, the spikes in blood sugar tend to be related to simple sugars and the glycaemic index. By focusing on complex carbohydrates found in many fruits, vegetables and whole grains, you can get the energy you need along with fibre for fullness. In recent years, the fat-free craze hit supermarket shelves and books, with many people then avoiding all forms of fat with the mistaken notion that they would gain weight. Good digestion requires fats, particularly for fat-soluble vitamins. Fat also takes more time to digest, allowing you to feel fuller for longer. In terms of taste, a bit of fat can really improve the taste of foods, allowing you to feel satisfied on smaller amounts of food. Some people find they will consume large amounts of fat-free foods because they don't obtain that feeling of 'eating' as they do when fat is consumed in the meal. A healthy tummy means obtaining enough fibre. Fibre helps to give you a feeling of fullness, which can mean you eat fewer calories throughout the day as you feel fuller for longer. It also promotes healthy, functioning bowels by promoting regular bowel movements and reducing the likelihood of stomach upset. An important point to note is that when you increase fibre intake you also need to increase fluid intake. Try to focus on a high fibre breakfast in particular as studies suggest that eating breakfast that is high in fibre can lead to healthier choices for the remainder of the day. 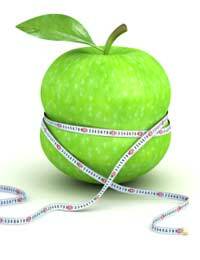 The belief is that you will be less likely to overeat and you will maintain stable blood sugar levels. Many studies have now linked probiotic 'friendly' bacteria with improved digestion, which could help you in your weight loss goals. You can take probiotic supplements or find probiotics in foods such as yogurts. Some studies have linked stress with higher levels of cortisol, which can increase visceral fat – that stubborn fat around your midsection. Reducing stress also means that you are less likely to partake in emotional overeating. Better still is that your overall digestion fares best when mealtimes are positive and stress-free. Making the right lifestyle choices is important to keep your tummy working at its best. When your digestion is optimised, you will not only feel better but you will look your best. Start making healthy choices today and you can enjoy a healthy tummy and a normal weight for life.